Wear this sparkly bracelet that skips and hops along your wrist! 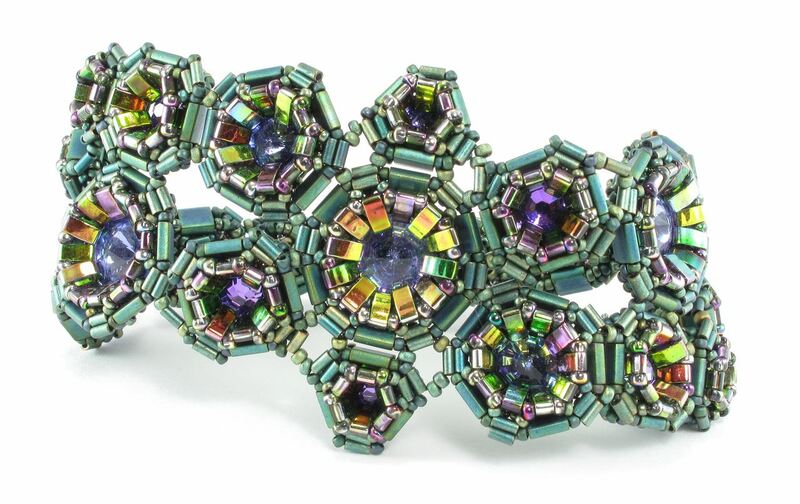 The Stepping Stones bracelet features four different shapes of geometric components that use a combination of Tila, Half Tila, and bugle beads to frame sparkly rivoli crystals. Monthly meetings are free to members. Guests will be asked for a $5 fee for each meeting they attend. Guests are welcome to attend general meetings, workshops and other events not designated as "members only" events. In case of snow or other severe inclement weather, please check this website as well as your personal email. As a benefit to members, discounts and bead rendezvous are available at Bead Shop Members. Some events, such as classes, workshops and the annual Bead Retreat, require registration. You may register on line by clicking the register button for an event and pay via Pay Pal or register off line by downloading and mailing this form with your check. You may also register and pay at monthly meetings. Check the samples for upcoming events displayed at meetings. If you missed the April meeting on Transitions, seek out the Bead and Button magazine issue for October 2007, the article can be found on page 75. We need suggestions for new meeting sites, for monthly meetings as well as weekend classes. Consider inviting friends to join you for the May meeting: the more people attend, the more money we can raise!